Dear Mona, How Many People Regret Their Tattoos? A man with facial tattoos at the 2013 London Tattoo Convention in London. How many people have tattoos and how old are they? How many people who have tattoos have more than one? And what percentage of people with tattoos regret at least one of them? Estimates about how many people in the U.S. have a tattoo differ slightly, putting the figure somewhere between 21 percent and 24 percent of American adults. What researchers do agree on is that the number varies between age groups and (if you take laser removal as a good indicator) tattoo regret varies by age, too. The most recent and reliable data I could find comes from a 2010 study by the Pew Research Center. 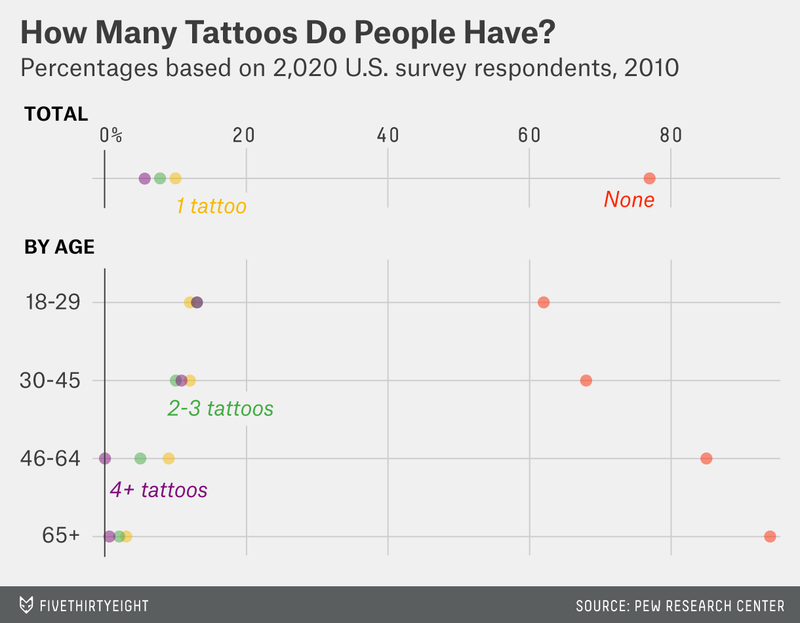 Of the 2,020 adults Pew surveyed, 23 percent had at least one tattoo. That percentage was lowest among those 65 and older (just 6 percent had a tattoo) and highest among those ages 18 to 29 (38 percent), leading the researchers to conclude that “tattoos have become something of a trademark for Millennials.” No wonder you’re asking the question, Michelle — even though you’re in the majority, 1 in 3 people in your age group say they have a tattoo, so you’re probably surrounded by a lot of permanent ink. Plenty of those respondents don’t stop at one tattoo. Among 18- to 29-year-olds, 12 percent said they had just one tattoo compared to 26 percent who said they had two or more. Incidentally, if you were in the NBA (strangely I haven’t yet got a question in the inbox from one of those guys), I’d have some different statistics for you. Fifty-six percent of players are tattooed, according to Ethan Swan’s dogged efforts to catalog every piece of body art on professional basketball players. But those were only the ones he spotted. When the Pew study asked whether those with tattoos had them in visible places, almost three-quarters said no, and an additional 9 percent said it depended on what they were wearing. That, of course, got me wondering where exactly on their bodies Americans are getting inked. The Army is also interested in that question, though for different reasons. Regulation 670-1, which became policy in September, limits tattoos “above the neckline, below the elbows, and below the knees” for new recruits. Finally, you had one last question I haven’t yet answered (well done for sneaking in three at once). When asked, “Do you ever regret getting a tattoo?” 14 percent of respondents said yes according to a 2012 poll by Harris Interactive, a market research firm. But take a closer look, and that statistic becomes less compelling. Harris interviewed 2,016 adults, of which 21 percent said they had a tattoo. So that claim about regrets is only based on 423 people. Here’s another way to spot strong feelings of tattoo remorse: laser removals. According to the American Society for Aesthetic Plastic Surgery, there were 45,224 procedures for tattoo removal in the United States last year — almost three-quarters of which were performed on women. Perhaps unsurprisingly, the age breakdown here echoes the age breakdown above — more than half of laser removals last year were for individuals ages 19 to 34. But there were also 261 tattoo removals on people 18 and younger (instant regrets, perhaps?) 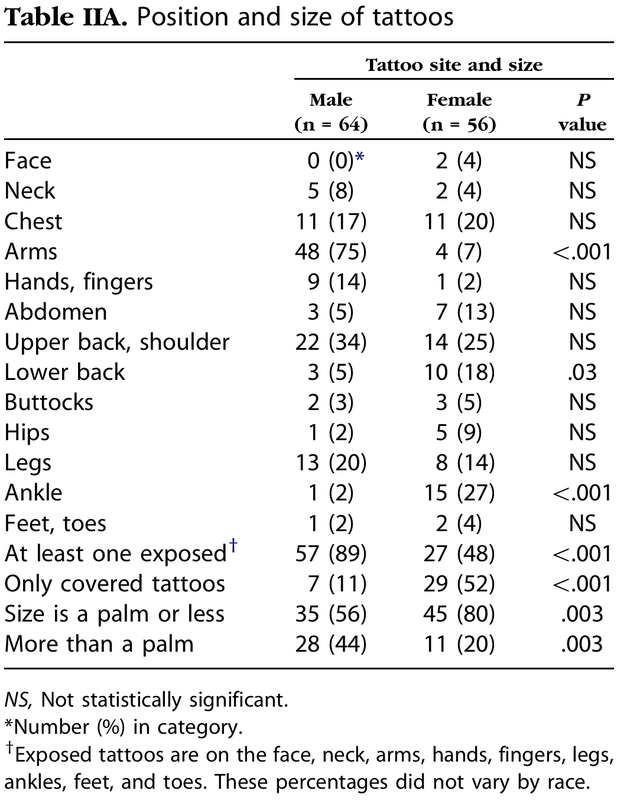 and 424 procedures to remove tattoos from people 65 and older (long-term ones?). Now for some shaky estimates of my own: If we assume that 23 percent of American adults do have tattoos (as Pew suggests) and that each removal procedure mentioned equates to one American adult (in reality, these were just removals in the United States, and, of course, one individual might get multiple tattoos removed), that would mean that 0.1 percent of Americans with tattoos had at least one of them removed last year. That figure would be higher if we looked at tattoo removals across all years, rather than just 2013, but it’s still pretty low. The bottom line here (which doesn’t sound like a great tattoo design) is that a lot of Americans, especially younger ones, get tattoos — and very few of them seem to have any regrets. CORRECTION (Nov. 6, 2:44 p.m.): A previous version of this article incorrectly said there were 424 procedures to remove tattoos from people 65 and younger. There were 424 procedures for those 65 and older.